Credit photo: Twitter user @ccasacub. The iconic Notre Dame Cathedral in Paris was engulfed in flames today, causing untold damage to the iconic building. “A terrible fire is underway at the Notre Dame Cathedral,” tweeted Paris mayor Anne Hidalgo. She wrote that the Paris fire department is working to quell the flames and asked the public to respect the security perimeter around the cathedral. Citing the fire service, CNN reports that the fire may have been caused by renovation works being carried out at the site. 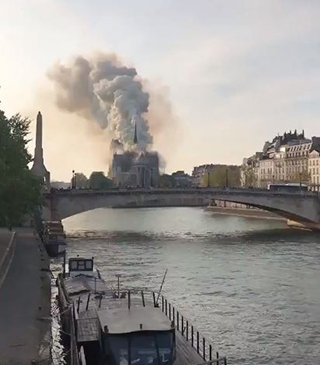 A video on Twitter posted by user @ccasacub, which has been viewed more than 1.4 million times, shows thick plumes of smoke billowing up from the cathedral and flames flickering near the spire. The nearly 700-year old medieval cathedral is the most-visited monument in France, welcoming 13 million people annually.